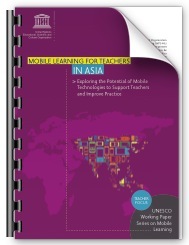 The seventh and eighth papers in the UNESCO Series (introduced on EduTechDebate here) examine mobile learning in Asia. 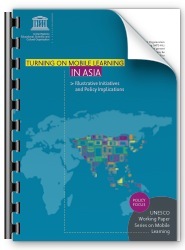 The first paper, Turning On Mobile Learning in Asia: Illustrative Initiatives and Policy Implications, describes a range of mobile learning programs and explores how these programs address educational needs in the region. It also surveys national and local policies related to mobile learning and analyzes their impact. The paper explains that South Korea has made concerted efforts to improve education with technology. Computers and mobile devices are common in classrooms and teachers and students are, by and large, eager to use them. Recently, the government announced plans to transition from paper textbooks to digital textbooks by 2015. The government wants textbook content to display on a variety of mobile devices including smartphones and larger-screen tablet computers. Leaders of the initiative have been piloting digital textbooks that can be tailored to a student’s individual abilities, interests, and pace of learning. Within the past several weeks however, Korean officials, responding to widespread concerns, have promised to slow down and even reconsider the plan. Perhaps surprisingly, the strongest opposition to digital textbooks is not related to doubts about their educational effectiveness or potential. Instead parents and others are worried that young people are overly reliant on digital technologies. A South Korean government survey suggested, for example, that one in 12 students between ages 5 and 9 are addicted to the internet. Many Koreans are concerned that a full shift to digital textbooks could accelerate what is, in some instances, an already unhealthy relationship to information and communication technology. A columnist for the Washington Post recently wrote about the controversy. In the past several years, journalists and scholars have exposed a dark side to digital technologies. Bestselling books like The Shallows written by Nicolas Carr, who has also moderated an EduTech Debate, and Sherry Turkle’s Alone Together argue that increasingly ubiquitous (and increasingly mobile) technology may not be good for our brains, our broader health, and perhaps even our productivity. Should South Korea initiate a full transition from paper to digital textbooks by 2015? Are arguments—such as the one Carr made famous in his Atlantic Monthly article Is Google Making Us Stupid—compelling enough to slow down well-intentioned efforts to integrate technologies in education? The second paper Mobile Learning for Teachers in Asia: Exploring the Potential of Mobile Technologies to Support Teachers and Improve Practice looks closely at how a handful of programs have employed mobile devices to support teachers and enhance their professional development. The most significant project described in the paper is Text2Teach (T2T) in the Philippines. This project, unlike a majority of its peers, has aged well: begun in 2003, it has been implemented in 555 schools in nine provinces, trained 1,500 teachers, and impacted over a half a million 5th and 6th grade students. Currently, the project is entering a third phase and planners are hoping to integrate it into broader and more permanent national education plans. At first glance, T2T is simple: it relies on mobile phones to bring educational videos into classrooms. Essentially, teachers download videos aligned with science, mathematics, and English language curriculums using school-purchased mobile phones and then play these videos by attaching the phones to televisions. The project—from its inception to its on-the-ground implementation—has sought to make teachers more effective, yes, but also to ensure that they complete less work, not more. Teachers report liking T2T precisely because it makes an already difficult job a bit less difficult. How can projects best leverage mobile technologies to improve teachers’ day-to-day jobs? What are your ideas for mobile learning projects that might give teachers less to do, instead of more to do? Written by Mark West on May 10, 2012 in Mobile Learning Initiatives. As a human-centered design advocate, I'm thrilled to learn that T2T is successful because it is "easy to use". More specifically, I love the reminder that it's about them (the teachers) and not us (the tech or the programs). We could all do with a bit more 'ease of use'. Great to hear about the success of T2T – my own informal surveys of teachers working with technology always show 'Time' as being the number 1 problem they'd like solved – so well done the the designers of T2T. I'm also wondering if UNESCO would now be keen to extend the reports to Oceania, simply due to the amount of varied and innovative mLearning projects occurring without which perhaps the worldwide picture is incomplete and lacking in some great results? Hi Jonathan, Unfortunately there is not scope to extend the current round of reports as these have already been published, but we would like to know about all mobile learning projects for possible inclusion in future reports. Please do let us know about mobile learning initiatives in Oceania. Thanks. Hi Mandar. Would love to look at your work as we are planningfor a similar project.